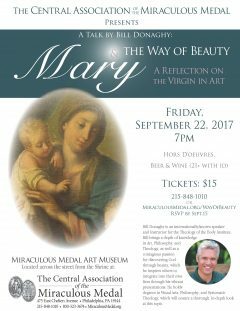 The Central Association of the Miraculous Medal looks forward to hosting internationally known speaker Bill Donaghy for a talk: “Mary and the Way of Beauty: A Reflection on the Virgin Mary in Art” on September 22 at 7pm in the Miraculous Medal Art Museum. Bill is a speaker and Instructor for the Theology of the Body Institute and holds degrees in Visual Arts, Philosophy, and Systematic Theology, which will ensure a thorough, in-depth look at this topic. The event is open to adults ages 21 and over, and tickets are available for $15 at www.cammonline.org/WayofBeauty or by calling 215-848-1010. RSVP by September 15. The Museum is located across the street from the Shrine at 475 E. Chelten Ave. Philadelphia, PA.